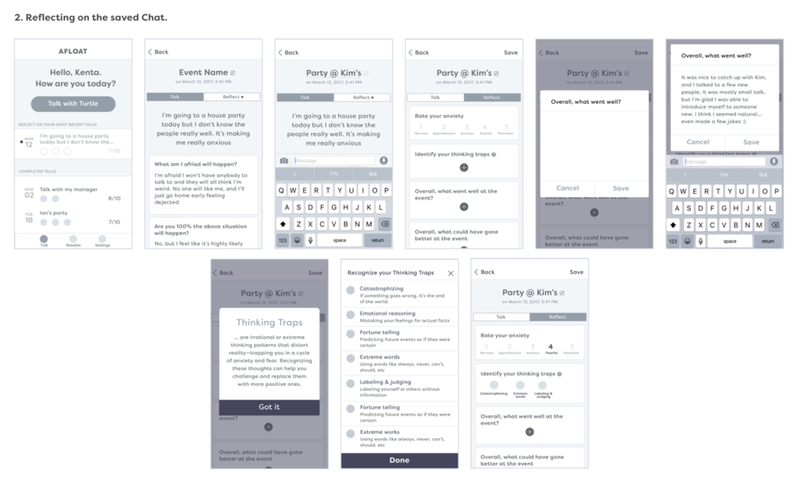 Afloat is a social anxiety management app I worked on as a side project. It uses a simple cognitive restructuring technique to reduce unrealistic thinking habits. The interface is disguised as a chat app, so users can practice better rethinking regardless when it's most needed. 15 million Americans over the age of 18 suffer from social anxiety disorder. While highly treatable with cognitive behavioral therapy, only a third of those afflicted actually seek treatment. When you considers the root cause of this phobia, it becomes clear that the disorder itself is preventing people from seeking help. I wanted to help break this debilitating cycle of anxiety. My goal was to make a simple, easily accessible, and preventive treatment that can stop further deterioration of our mental health. Where are you when you experience the most anxiety? What are the symptoms? What physical and mental state do you define as the feelings of social anxiety? How do these symptoms directly affect your day-to-day life. What kinds of methods or tools do you use to cope with anxiety? In a stressful situation, people need the space and time to refocus and feel more grounded—whether that's going to the restroom or looking at their phone. People KNOW that their irrational thoughts prevent them from fully enjoying life. They want to challenge themselves beyond their comfort zone but find it difficult to maintain control of their emotional state. There was some confusion with taxonomy, so I created a quick map to show how the key features of the app existed in relation to each other. This map also includes potential future features. Flow 2: Reflecting on the saved Chat. Once saved, a Chat becomes a Journal entry that you can reflect on. The Reflect exercise consists of rating your level of anxiety, identifying poor thinking patterns, and answering some questions. Users like the idea of a rethinking exercise disguised as a chat. Users are confused by the "Edit" feature for the messages they send to Turtle. There needs to be better communication that, once saved, the responses cannot be edited. The deep breathing exercised needs to have a time limit. Once in Reflect mode, the default view is the Chat tab (you can view the chat you had with Turtle), so people seem to miss the Reflect tab. 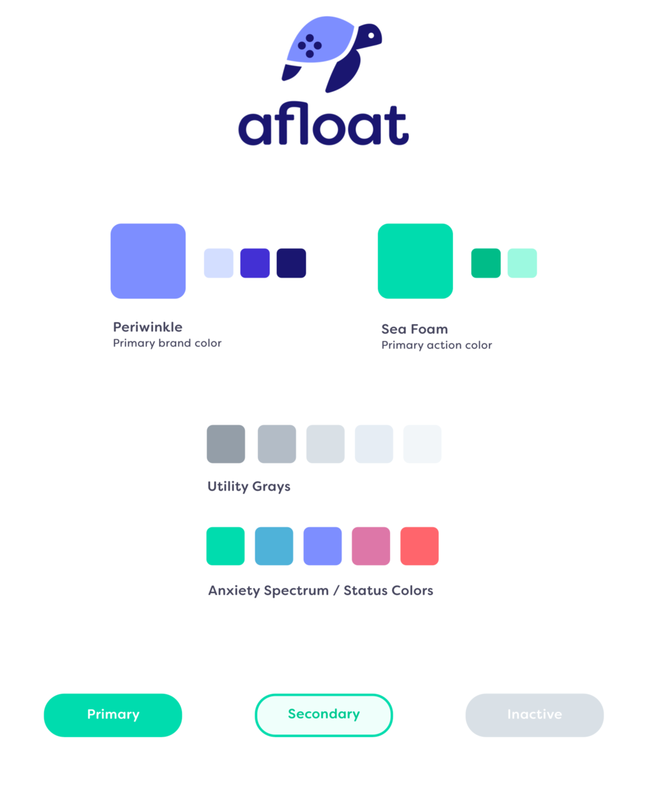 It was important to me that Afloat has a light-hearted look and feel, along with cool and calming colors to bring a wholesome, delightful experience together.